This afternoon we were lucky enough to be enchanted by Disney's Mickey's Magic Show. Opening today at the Wales Millennium Centre, Mickey and his chums are currently touring the UK. With a 3 year old who has been mesmerised by the Mickey Mouse Clubhouse for the past year we have been building up to today for some time. 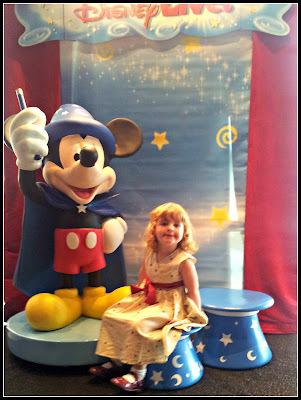 A previous trip to the Disney Store had left her disappointed, there was no Mickey Mouse. Today my little girl reached Cloud Nine! Mickey's Magic Show means we got larger than life Mickey, Minnie and friends keeping every child enthralled, and in Squeaks' case, gave us our first introduction to magic. With two hosts (Brad and Benny) keeping the show sewn together, and plenty of new Disney characters for Squeaks to get to know we were completely engaged for the duration. Every time Squeaks really got something she shouted "Again, again! ", whilst to no avail, she didn't need to wait long for the next illusion. The best bit was reaching the intermission and Squeaks getting upset, being able to promise Mickey would be returning in ten minutes really made me feel like mummy had done good! The intermission was a great break of focus and for ice-cream. Squeaks had started to lag towards the end of the hour, but came back full swing for the second half. Whilst you are not able to take photographs during the performance I may have snapped a couple of beforehand to show how excited someone was! 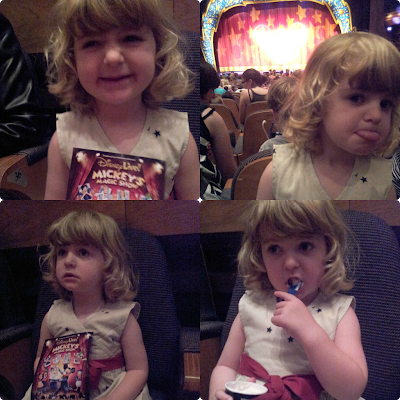 And also at the beginning of each half, a complete testament to how well the show engaged a three year old! In terms of the performance itself, well, we took a three year old and an eight year old. Both were completely engaged throughout. In fairness, whilst I love watching Squeaks' reactions to everything, this was short lived as I, the grown up, was completely drawn in. 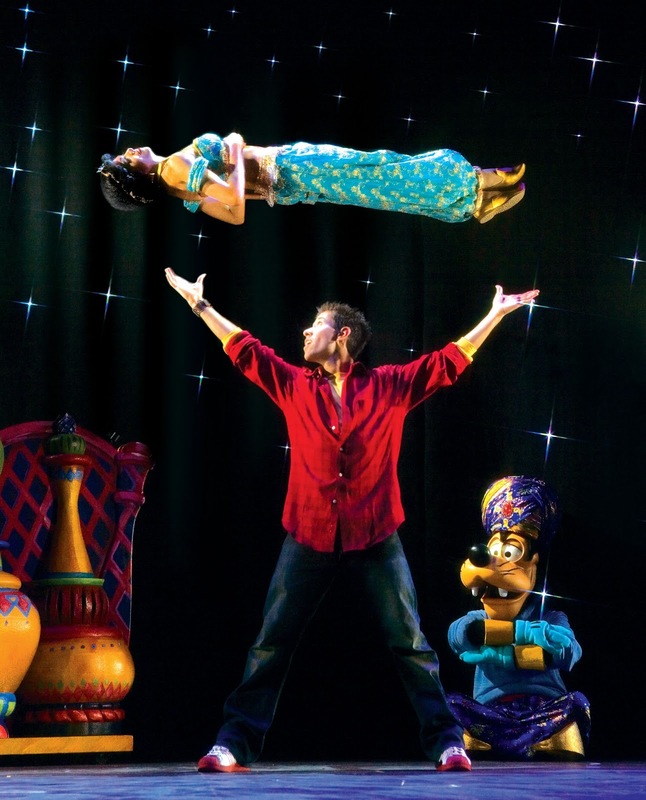 Because the show successfully integrates illusions and magic with your Disney favourites it succeeds in entertains the family. Outside of the illusions with Mickey and friends in the one that completely won Squeaks over was Cinderella. The fairytale Disney brings to life best. Squeaks loves the story at bedtime and this just completely enchanted her as the fairy godmother did her work. For me, it will always be Aladdin, and the levitation of Princess Jasmine had me completely drawn in. For me, the performance gets a massive Disney thumbs up. It is more expensive than other theatre performances we have been to, it does merchandising far better than any other show- but it is Disney. And Disney just knows its audience and knows we are here for the magic, for the fairytale, and almost, for the luxury. We have always planned to take the children to Disneyland Paris, and hopefully one day to Florida. Shows like this make me excited about the children growing up. From today's performance I think we might try Paris for the boys fourth birthday (forward planning at its best) but I am already so excited for Squeaks. Today was just what Disney means to me and from watching Squeaks I think this is definitely something that won't stumble on a generation gap! Disclosure: We were incredibly grateful in receiving four tickets for this performance from The Walt Disney Company. All opinions expressed are our own. Oh you are so lucky to get to go to something so lovely sounding! I can only hope that something like that comes to Tasmania soon! Wow! Tasmania!! I'll keep my fingers crossed- or maybe a Disneyland on your doorstep?!! Disney fantasy continues!!! 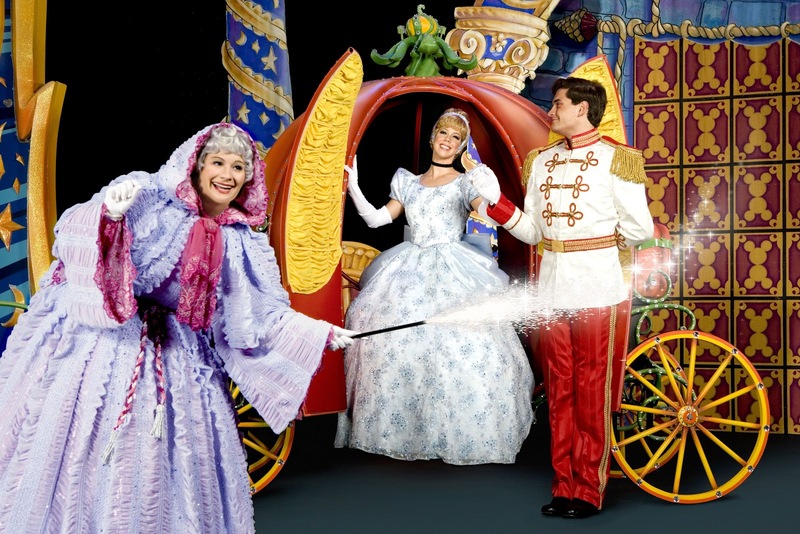 I wish the same Disney magic show on my child's birthday. How can I create the same level of magic? It looks expensive. Isn't it?